I first started sewing at the age of 6, by hand. I still have the little red tin that I got for Christmas that year. It had the little tiny spools of thread, and needles in it and my mother taught me how to stitch by hand. For the next 20 years, every time I had to sew something--be it sewing on a button, or hand stitching a flamenco skirt—I did it all by hand. My mother, ever the instigator, was also the one that bought me my first sewing machine. At age 26, I eagerly sat, and watched the instructional video, from start to finish. My first projects were a sheep costume and a little Bo Peep costume, for me and my boyfriend at the time. I was the sheep…do with that what you will, but after feeling the speed and the power of machine sewing, I couldn’t believe I had never, ever used a machine before. What had I been thinking all those years? Making hats, and shirts, and pillows and failed fashion experiments by hand when I could have been cranking out project after project. After that, I joked that I would have made a perfect wife…back in 1812. You know, when middle and upper middle class girls were expected to learn piano, French and embroidery to try to nab a good husband? With all of those old, dead skills I’d have been quite a catch! But, as I’ve spent the seven years since then stitching by machine, I have learned something. Hand sewing can achieve some results that machine sewing cannot…and GOOD handsewing is a unique and magical skill in the age of machines. So my skill in meticulous handsewing, long ignored, inspired me to pick up a book called Couture Sewing Techniques, by Claire B. Shaeffer. It’s the perfect book for those of us with an underutilized skill in handsewing, for those who would like to take their sewing to new artistic levels, for all self-proclaimed sewing geeks, and…for anyone who ever wondered why an haute couture garment is worth $50,000. It discusses the history of couture sewing, the historical context of couture sewing, as well as the essentially ancient techniques couturiers use to achieve their garments. It is detailed, but easy to read…and the photographs of couture garments, from both inside and out, are inspiring. The book does not offer specific projects, but rather offers techniques for specific types of needs, such as anatomy and techniques of sleeve-making, or how to sew proper darts. The detail is what I love here…there are descriptions of specific types of hand-stitches and when to use them…when to draw your thread through beeswax prior to stitching and when not…the process of cutting, basting, fitting, stitching and finishing garments…lovely. All of it is just lovely. I'll absolutely get this book! I've always been in awe of the attention to detail of the couture houses. 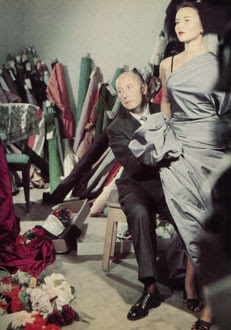 There was a PBS documentary a while back about the women who buy and wear couture. Watching the show, I realized that these women spend hundreds of thousands of dollars on haute couture, not because they are social climbing fashion addicts, but because they are art collectors in the true sense of the word. YES, I think I saw that same documentary Betsy, it was amazing. They really do understand the work and the talent of the couturiers they buy from. I also loved the fashion exhibit at the MFA a couple years ago? When You see these clothes in person...breathtaking. Azzedine Alaia's collection literally gave me chills with all of it's textures, Yohji Yamamoto's collection of sparse lines was haunting, and John Galliano, his work was totally bombastic and very "editorial" as they say...just WOW. One of the other great things about this book was that, while my work is hardly this specialized or intricate, I gained renewed appreciation of the work that I do and that all artisans do.